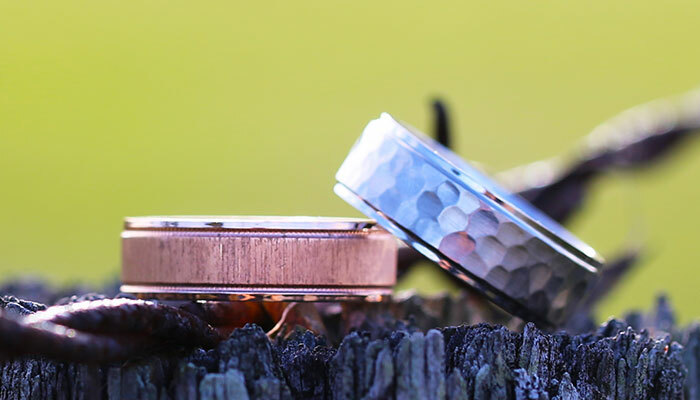 Find the perfect mens wedding ring with our buying guide! Need help? Speak to an expert at 866-737-0754. 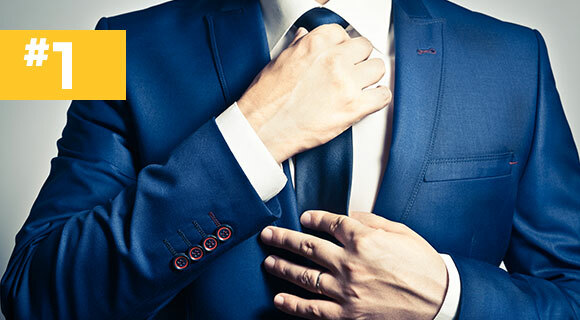 Find the perfect mens ring with our buying guide! Having a strong grasp of his style is key to finding the perfect wedding ring for him. Is he flashy or does he prefer the simpler things in life? Does he dabble in dapper or does he have that scallywag swagger? What’re his favorite hobbies? Who’s his favorite team? What’s he like listening to or watching? Does he even wear jewelry? He’s going to be wearing this ring every day so choose a ring that reflects his ideal style. 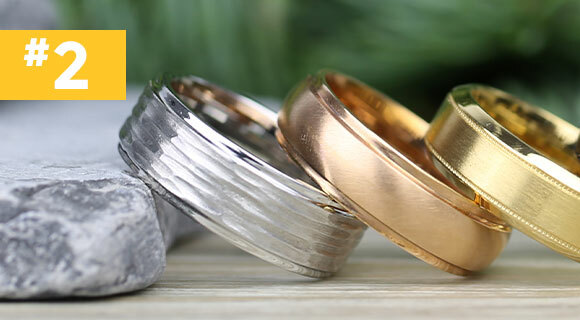 Learning about the various types of precious metals that men’s wedding rings can be made from will give you both deeper insight into the vast selection of available options and the confidence to make the best decision. 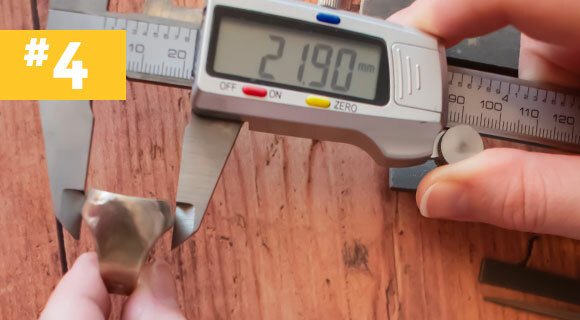 If he works with his hands, then consider sturdy metals like platinum or tungsten that won’t bend or scratch. If he’s into making a statement, Damascus steel or carbon fiber might be the best options. Even if he just wants something simple, you don’t have to settle for classic gold. This is where you get to have fun with his wedding band! Details like inlays and sleeves are sleek and elegant ways to add texture, color, and intrigue to his ring, coming in all different materials and hues. Choose from a wide variety of materials such as prehistoric dinosaur bone, mother of pearl, wood of various types, red or blue (or both!) opal, intricate carbon fiber, or even genuine meteorite. 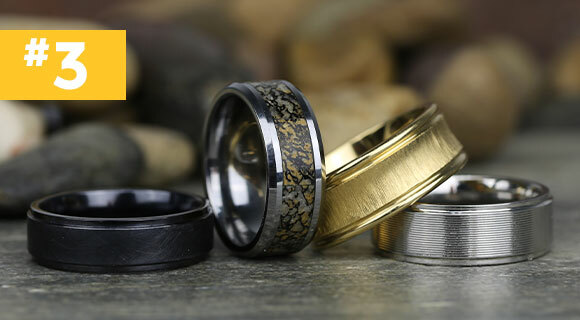 Now if he wants something simple, then a basic band might be ideal and are offered in many alternative elements, each with their own unique properties and features. 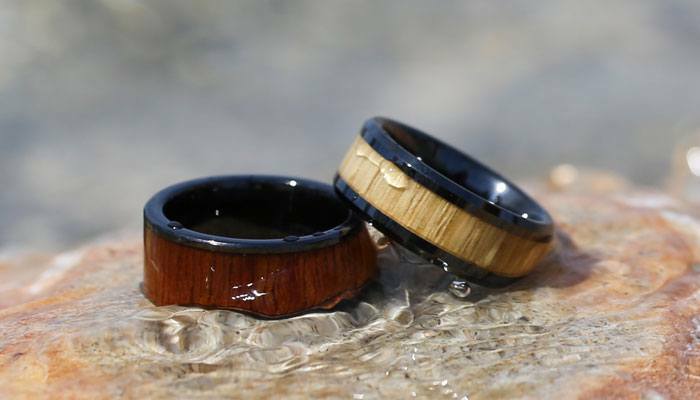 Unlike the ring’s diameter, you won’t need to worry as much about comfort or security. Ring width is more a matter of taste and aesthetics. Ring widths between five and six millimeters are the classic size preferred by most men who wear rings. 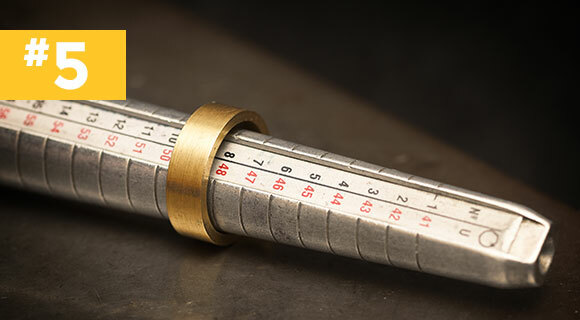 If you choose a ring with a width between seven and nine millimeters, then prepare for a ring that makes a statement. This is a great choice if your ring’s design contains an intricate inlay or an important engraving. The more classic ring widths of three and four millimeters have a much more delicate appearance, but can still be worn by those who possess more slender or elongated fingers. 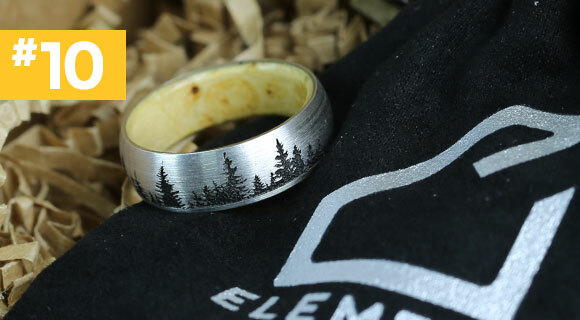 Unlike an engagement, which is intended to be a surprise along with the proposal itself, you’re both pretty sure that you’re getting married, so it would make sense to know what his ring size is for the wedding band. The ring should not slide around too easily or fall off his finger, but be big enough to slide comfortably over the ring finger knuckle. For the best accuracy, measure at different times of day and when the finger is a different temperature. We offer several options in finding the perfect ring size as well as a comprehensive chart that you can download here. Need help choosing a diamond or the perfect ring? Speak with our diamond & jewelry experts at 866-747-8458 or chat now! Once you know his style, you can start narrowing down your options to rings that fit within your budget. 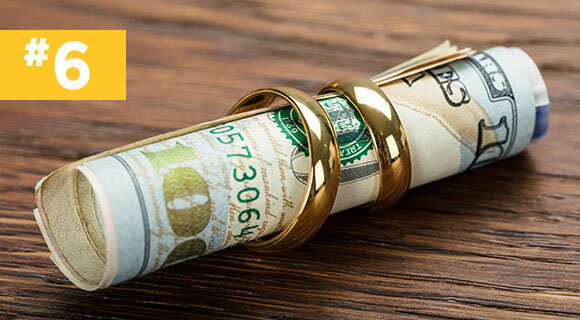 It’s important to have a set budget that you will stick to, otherwise, you might fall in love with a ring that is thousands of dollars over what you intend to spend. A respectable jeweler will help you find the perfect ring within your budget. If they try upselling you or recommending products to you that you’re not interested in, you may want to look elsewhere. Now that you have a clear idea of what you want, you’re ready to look for a place to buy it! It’s important to shop around, compare the competition, and ask questions. 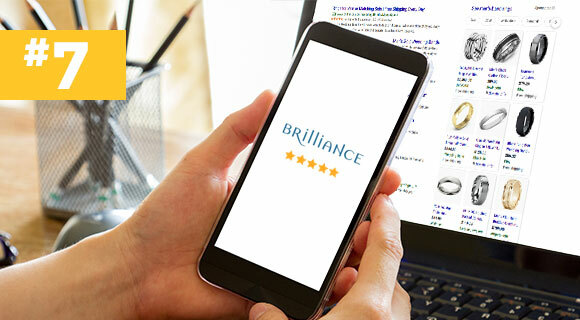 Although you can sometimes buy a ring online for half the price you would pay at a brick and mortar retailer, it’s still important to read customer reviews on any place you’re considering buying from. For example, we have thousands of 5-star reviews that you can read right here! Previously in Step 6, we stated that “a respectable jeweler will help you find the perfect ring that is in your budget.” They should also give you a sense of confidence and make you feel comfortable throughout your entire buying experience. 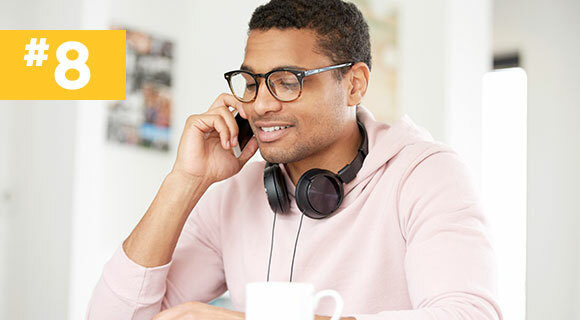 Asking questions about their return and warranty policies, as well as the overall quality of their products will ensure that you don’t run into any issues later on if something were to happen. If they’re not willing to give you this information up-front, then it’s time to look elsewhere. Most jewelers don’t have their prices set in stone. Additionally, most companies run deals year-round. That being said, you should always make sure to ask if there are any coupons available before placing your order. You can check out some of our special deals here. Step 10: Buying the Ring! After going through all of these steps sequentially and successfully, with no doubts in mind, there’s only one thing left to do: buy it! Take pride and solace in knowing that you’ve done everything right in getting the best wedding band for your man, but if there’s still something nagging at you, you can contact our jewelry experts who are available to help you anytime. Nevertheless, congrats and cheers to your happy union!